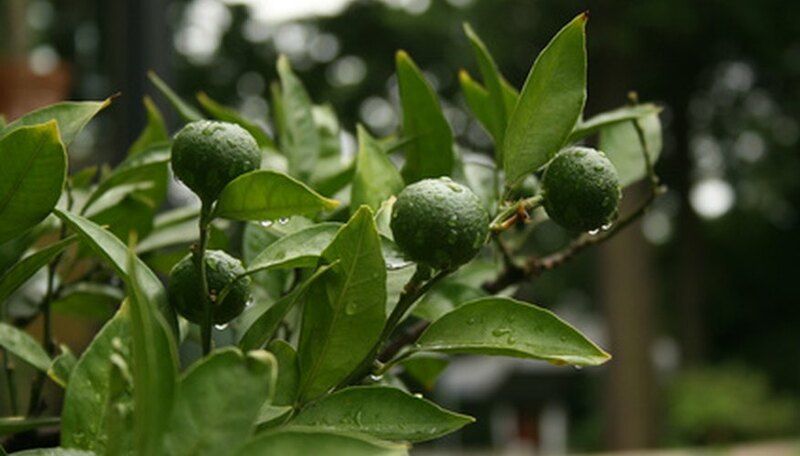 Commonly known as Persian lime or Tahiti lime, Citrus latifolia has a short and unclear history. This fruit is believe to be a cross between a Mexican lime and citron or lemon, according to Purdue University. Persian limes are more cold-tolerant than Mexican limes but can experience a number of citrus tree diseases. Citrus greening is a bacterial disease that has no treatment. Symptoms include yellow blotching on leaves, smaller leaf size, reduced tree vigor and dieback of the branches. Affected trees decline and die. Persian limes from affected trees will appear small and have an off, bitter flavor. Remove affected trees to prevent the disease from infecting other citrus trees in your yard. Persian lime trees can develop citrus canker, a bacterial disease that's spread through wind or rain that carries spores from infected equipment, clothing, animals or humans, according to the University of Florida. Affected trees develop raised brown spots on young fruit and leaves, surrounded by a yellow halo. Severe cases of citrus canker cause foliage loss. Copper fungicides can treat citrus canker. Lime trees affected by greasy spot show discoloration in the leaves. The leaves develop yellow blotches on top, while the undersides appear darker in color and greasy-looking. Humid weather and rust mite presence can lead your Persian lime to develop greasy spot. To control this disease, apply a fungicide or citrus oil, recommends Texas A&M. Caused by the fungus Elsinoe fawcettii, scab affects all types of citrus including the Persian line. This fungus produce pinkish-gray growth on the leaves, twigs and developing limes. As the disease develops, the scab spots darken in color. Wetness from rain or overhead watering can cause scab to develop. Applying a protective copper spray shields lime trees from this disease.